We were sent this interesting book from the United States where the rise in publication of personal accounts and diaries through self-publishing and, equally importantly, through the vision of enlightened publishing houses has yielded some genuinely excellent material. 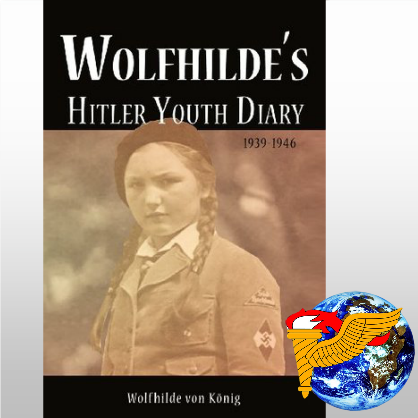 Here we have the diary of a young girl growing up through the climactic years of the National Socialist regime in Germany. It’s fair to say that the fascination with the Reich and all it’s works remains as strong as ever and finding new angles to it all occasionally throws up something different. That is definitely the case here with the day thoughts of a person well and truly caught up in events. Wolfhilde von Konig tells us all about her day-to-day world while adding snippets of news from the progress of the war, the victories and set backs, deaths of leading U-Boat skippers, etc; which give a strong impression of life in Germany during those crazy days. She discusses a wide range of topics fitted around the practicalities of her education and tasks within the state. It is quite understandable that impressionable young people, indoctrinated from an early age would be so wrapped up in events and we do well not to get mired in hindsight. Her viewpoint is totally controlled by the propaganda coming out of Berlin and the reader should not look for any startling Eureka moments of realisation the Nazis are the utterly evil scumbags we know them to be. At the end of the war our heroine appears to be in complete denial about the totality of the Allied victor, clinging to the belief that defeat could have been averted militarily. The strength of this book, in her contemporary thoughts and actions tells a real story you rarely find in second or third hand accounts. So, just take it all for what it is and learn from it. I was going to say ‘enjoy’ but that isn’t something I find myself able to do… but different strokes, etc…. I have to say I was deeply impressed with the efforts made to get it into print. Wolfhilde wrote her diaries using Old German sutterlin script and this proved a challenge to get translated. All power to the people who achieved this, they have done us a service.